Conferences: who pays? What does it change? Some musings based on a question asked on Twitter. Allergies, THE GREEN, AlterConf, and the bubble car. Plus a new project? I made 2. They were ok. I still need to buy buttons, but it’s pretty much done. Overall, I enjoyed the knitting. It was quite straightforward, with the exception of working out the eyelet row. I probably should’ve gone up a size but I’m pleased with my first sweater! Did 2 swatches – one on #8 which was a smidge large, and another on #7, which was just a hair small. Going with slightly small on the assumption that it’ll stretch over time. 4/26 – 2nd buttonhole, slightly better than the first one, also found a few buttons of about the right size, might not use them but will make a good model. 4/28 – final buttonhole! Much better construction but not 100% sure it’s the same size. 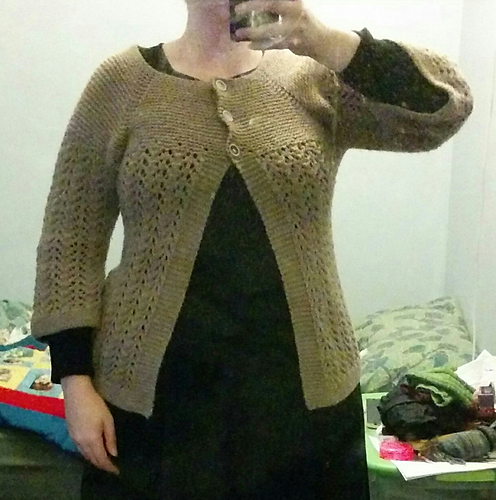 Also did the eyelet increase row with just the right number of YOs. (start w/YO, then one every 6 stitches, except last is 5st, then final YO. 5/1 – first row of lace, discovered I was short exactly 2 stitches. Made up for it by not doing decreases in last repeat. 5/4 – now that I’m just on the body, it seems to go quite a bit faster. 5/6 – achievement unlocked! mild mangling of lace pattern, followed by getting back on track. Looks like it’s just on the front left panel. 5/17 – started garter stitch for bottom edge! Outline of the presentation I gave on May 30.